*Player must beat all previous classes in order to unlock. 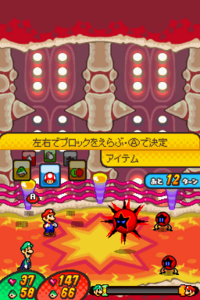 Scutlet, Chakron, the Dark Star Core, and the Shroobs are the only bosses that Mario and Luigi fight which don't appear in the Gauntlet. If the Bros. lose against Durmite X before receiving the Badges from Princess Lipid, the Emoglobin at the door will still mention their existence. This page was last edited on March 17, 2019, at 19:11.